This was our 2nd full day in Washington state, it was a long day driving to two beaches and a visit to the Hoh Rainforest. All of these places are considered part of the Olympic National Park. 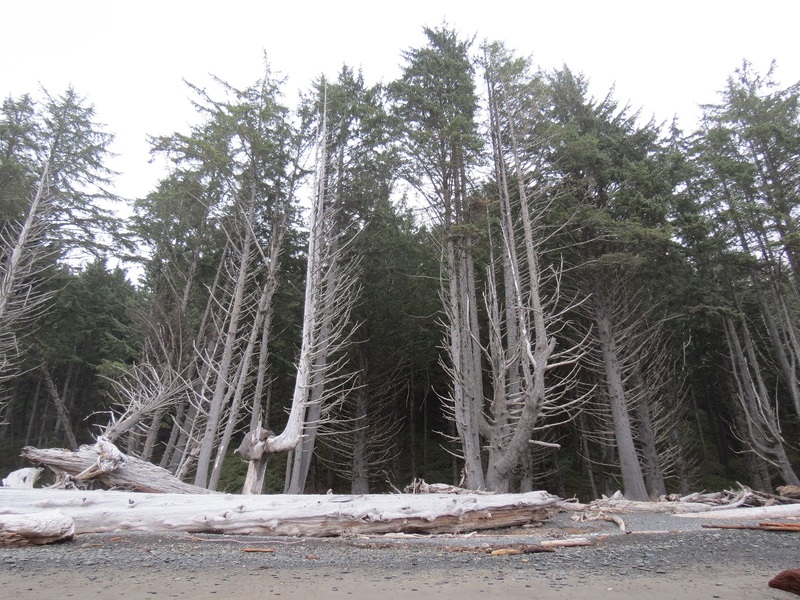 The tall trees that border Rialto beach, some look ready for the waves to come and claim them. The first beach we stopped at is called Rialto Beach, the driftwood was actually whole trees washed up on the beach. Some of the roots were taller than we were when we stood next to them. I am pretty sure the birds flying over were the Snow Geese, a closer look at my photo you can see they were white with black edges on the wing tips. It was a cloudy day but only a little drizzle, it did not stop us from doing what we planned. The beach at Rialto is made of stones and lots of washed up trees and driftwood. 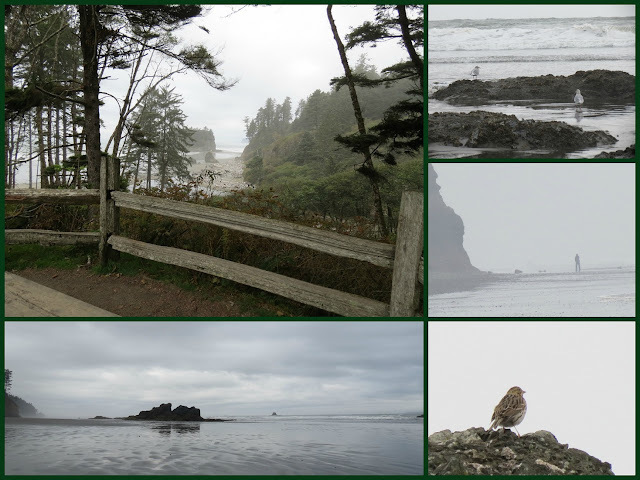 Above are some scenes from the second beach called Ruby Beach, this beach was my favorite. I love the seastacks, the forest, and the ocean. Bird sightings included the Savannah Sparrow, various gulls like the California Gull, Cormorants and Brown Pelicans and the Bald Eagle. A pretty Savannah Sparrow kept me company while hubby walked further down the beach. 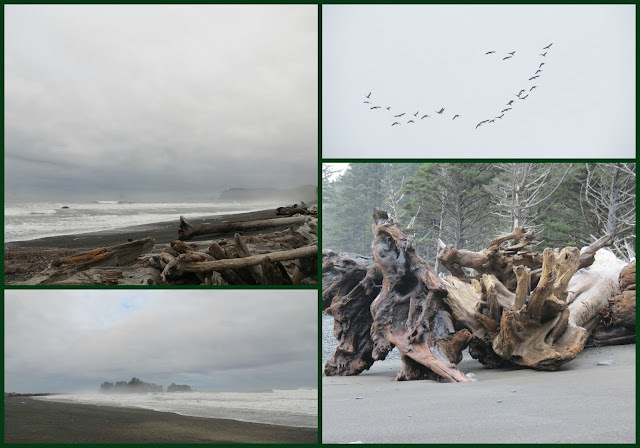 Seastacks, driftwood and stone sculptures and cliff with the pine and fir trees all pretty scenes from Ruby Beach. Above the cliffs with some caves, a seastack with Cormorants and Pelicans, an Eagle on the beach, seastack with trees and driftwood roots that look like a sculpture. 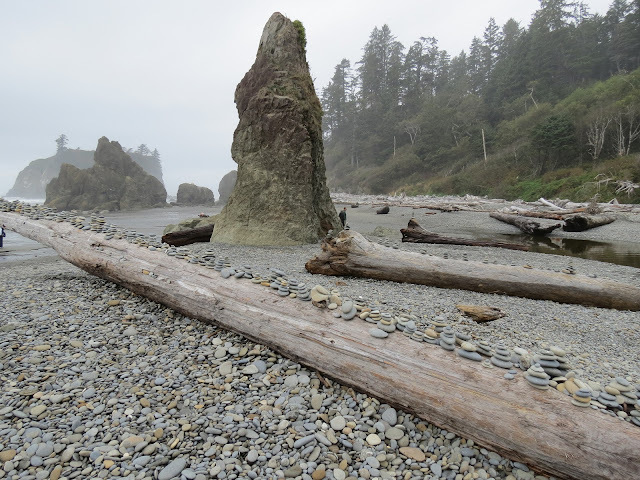 I hope you enjoyed our visit to the Olympic National Park beaches. As always I appreciate you visits and nice comments. Thank you! Have a happy day and new week ahead! Thanks for visiting my post and as always I appreciate your comments. Thanks to Mersad for hosting Through My Lens. Both the places looks beautiful. You have brought the visualization of the places for me by sitting in my house. Have a nice time! Those trees look like they have many stories to tell. Beautiful, every one, but my favourite, the wee bird close up. And those logs, imagine the huge seas that wash them there. What a beautiful + mystical place! Incredible! I would LOVE to visit! And what a sweet little sparrow! Have a beautiful week! Your lovely photos brought back great memories of visiting there many years ago. Such a wild and beautiful coast. Thanks for sharing and hope you have a nice week ahead. Truly fascinating, inspiring, beautiful images, Eileen! The sparrow photo is excellent and the polished stones look lovely. Nice shots - I remember all the fall trees on the beach. We stayed a few days in Forks! Great views from the National Park. Beautiful! Natural power is stunning.The Savannah sparrow is very pretty. 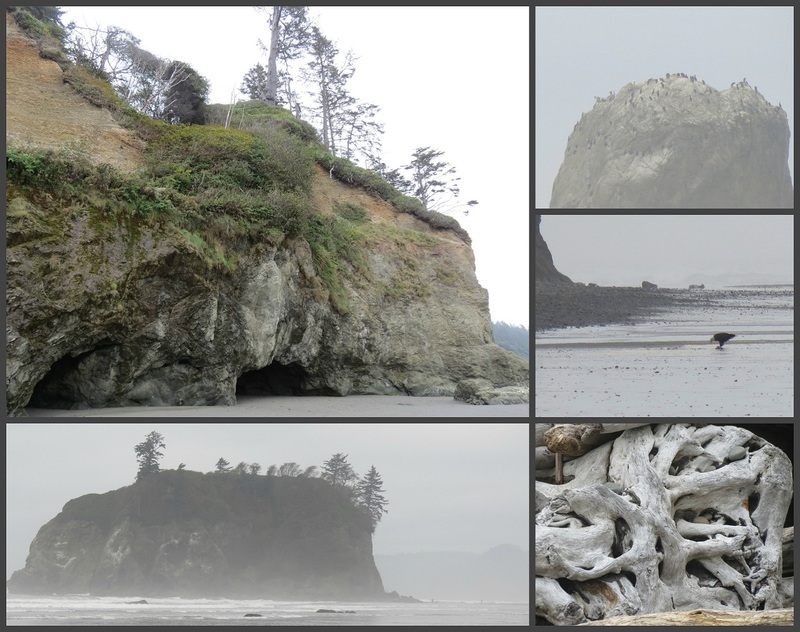 All so pretty....but that one image of Ruby Beach stands out for me. Now that is some driftwood----beautiful. The driftwood is so beautiful! Olympic National Park is a great place for photographer. Your photos are beautiful! I am sure the drift wood would make some gardens very beautiful. This park has a very desolate look to it. so much on this beautiful Earth to take our breath away. I wish I'd been there with ya!! Very interesting pictures along the beach. The trees look so stark and gray. Love the driftwood. The beaches are all intriguing. Not the kind that you want to lay on and catch a few rays. Eileen, I love your photos especially the bird one and I like your mosaic layout with the larger one with several small ones. Sylvia. Beautiful shot of the Olympic Peninsula. We love it too. Fantástico este belo Olympic National Park. From my bedroom window I can see the Olympic Peninsula Mountains across the Strait. I've thought it would be a fun place to explore and your photos convince me even more. Gorgeous wild shots. Enjoy your trip! Great shots... and an adorable shot of that litte sparrow! it looks cold out there, but thanks for the tour Eileen, and the map so I can get my bearings. Happy travels. I am reading the book "Wild" at the moment. Amazing driftwood and seastacks! Beautiful misty views! Great photos, Eileen! Wow Eileen! What an amazing place ....thanks for sharing this. Oh, and I loved that one, with the sparrow... so cute!!!! Another great sequence of images! Very cool. I saw my first beach with trees on it yesterday. So different than what I have seen in the past. Your pictures looks wonderful again Eileen! You can make amazing posters from these foggy pictures. Have nice week! Beautiful pictures of beautiful surroundings. I love the Savannah sparrow. A great post! Love all that driftwood. Wonderful collages you make Eileen. The captures are too good. Gorgeous photos, Eileen..Love anything with sand and sea..Wonderful first picture..Enjoy your week!! Really beautiful photos. What an interesting place to have an adventure! Have a grand week! Great photos, a very pretty Savannah Sparrow and all that driftwood is lovely. Happy week to you Eileen. These pictures bring back the wonderful trip my son took us on out there. I remember all the drift wood and the size of it. We stayed in the cutest little cabin on the water. What a treat. Your photos are just beautiful and portray the area perfectly. Superb captures as always, Eileen!! Thanks for sharing the fun and the beauty!! Hope you have a great new week!! What a wonderful looking place that is Eileen. It looks rather wild and wonderful but perhaps because of the day you encountered? I'm sure there would be lots of folk there on a sunny day? The Savannah Sparrow picture is brill - how did you get that? Oooo... these are gorgeous ocean beach photos. Love the wildness of them. 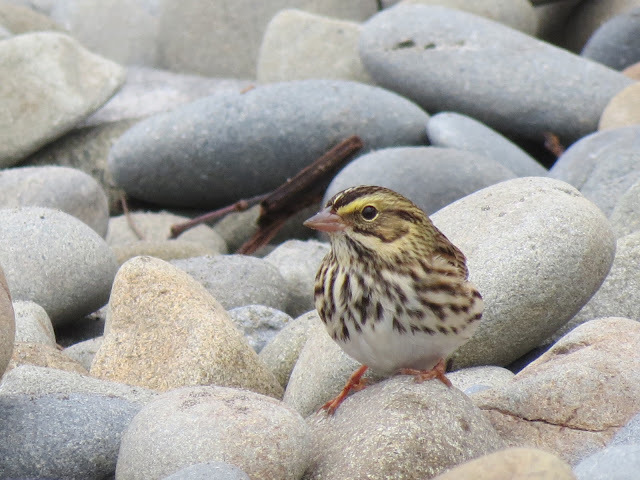 Especially enjoyed the little savannah sparrow on the rocks. Coming to you via Mosaic Monday. Thanks for a lovely visit. Love the stark beauty of the place! Driftwood seems such an inadequate word to describe those giant trees. The weather has given another mystical dimension to your photos. There's a beautiful quality to foggy gray. Love that warm blooded peep of a bird i the mix. I have been to La Push before and absolutely loved it. I still remember it as one of my very favorite places. The fog and mist make your photos look so wonderful. I know a few competitive floral arrangers that would love to pick through the driftwood Eileen. One gal brought a piece back from Vancouver in her suitcase that she found on the beach. Wow what an interesting place with all the driftwood. Beautiful. Oh this is a beautiful place....I love all the wood carved by nature. The landscape is mysterious. I have yet to see this part of the coast. Really beautiful scenery. I haven't been to this part of the states. I like drift woods ! Wonderful photos ! Thanks for sharing . have a good day ! What a beautiful place - I really need to visit the Washington sea one day. I like seeing the map and knowing where you were. What a beautiful place to visit and take photos. I love that black and white look of the mist too! Hugs! Another set of marvelous sceneries. I want to bring that piece of driftwood home, and attach some of my epiphytes, lol. Many great photos here! Have a nice week! This looks like such a wild and unusual place, Eileen. It is almost as if you were on a different planet. What a wonderful adventure this must have been! wow, that nature is wild. I love everything about it. Thanks for the map showing me the location. Love all the driftwood shots as well as that lovely cloe up of the Sparrow. I do like that Sparrow photo, Eileen. You certainly managed to capture the atmosphere on one of the duller days in a beautiful area. Bom dia, o ângulo foi perfeito para captar, as imagens das velhas árvores ficaram maravilhosas. Wonderful trips you take us on . . .
Those trees are mysterious and the driftwood just lovely! Those are some stunning but very stark pictures. Just beautiful. All your pictures look so real.The lively beach,the logs with their weird shapes,the delicate sparrow and the rest of the natural phenomenon look so gorgeous! Hi! The Savannah Sparrow is very cute. I like your Ruby beach photos very much. Thanks for sharing. Gorgeous! A really special NP! Beautiful panoramas, they are excellent. What absolutely fantastic photos! Wow...the trees in that first one are something else...and the driftwood are pieces of art! 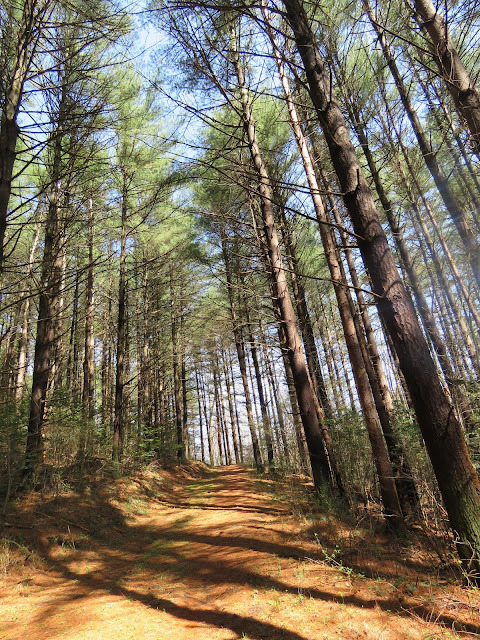 Those trees speak volumes with an incredible story. 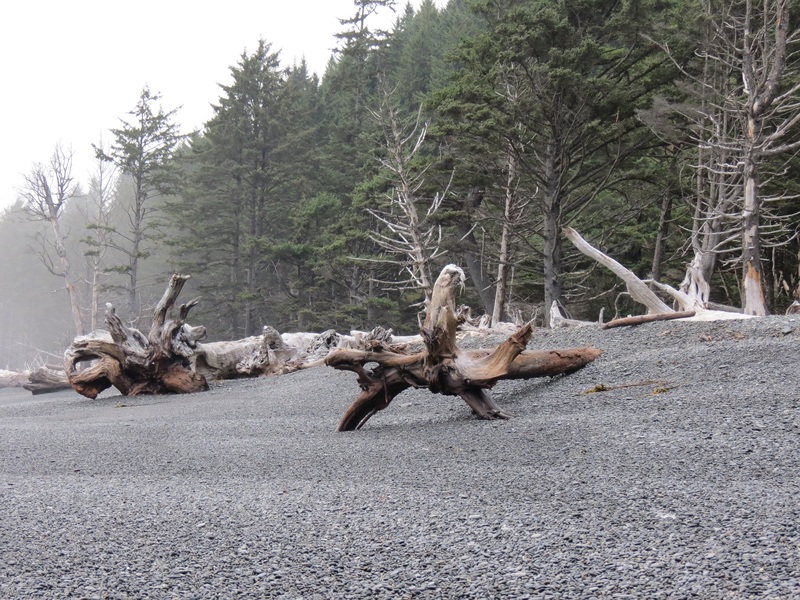 What tall trees, and the driftwood is amazing - such sculpture and shapes. Just love the Savannah Sparrow. It's magic land. Very mystical looking landscape with some lovely bird finds as well. I hope I get a chance to go there one day. Enjoy your week! A great set of pictures, the driftwood in particular looks amazing. You've captured the detail and texture so well! marvelous and mystical photos of this wonderful place, the birds and the wood. Fantastic ! The Sparrow is very pretty. Wow...amazing location. Love the driftwood on the beach and that cute little sparrow! Beautiful scenes. I love being on a beach that is totally exposed to the elements: wind, rain and surf. Great driftwood and rock formations. Visiting my daughter in Oklahoma so behind in my visits. Sitting here today and enjoying these intriguing, magical and mysterious photos. So powerful knowing all of this was created from the elements. It looks wild and wonderful there! Your photos are beautiful, Eileen. I really loved seeing the sweet little sparrow, too. This is not only extraordinary but also really very nice! Dramatic scenes! Great birds as usual! such beautiful locations! great rock formations too. thanks for taking us along with you. Wonderful photos! I love the seastacks and the driftwood. The sea takes, but it captures what it took. Giant trees and roots incredible look on the beach. Regards. I really did enjoy this visit...I love all that driftwood. And that last one that looks like a sculpture is really awesome. I wish I had it in my yard. You captured the other-worldliness of this Park /Beach just beautifully.